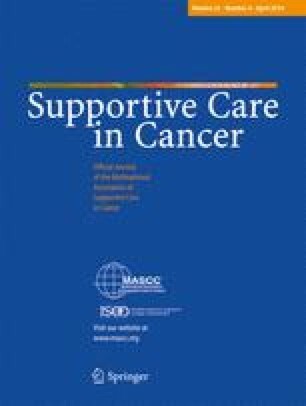 We prospectively evaluated the prevalence and predictors of complementary medicine (CAM) use among Japanese patients with urologic cancer 1 year after diagnosis. A total of 349 patients with newly diagnosed urologic cancer answered a self-administered questionnaire on CAM use 1 year after diagnosis. General-health-related quality of life (GHQL) of the patients was also assessed at diagnosis and 1 year after diagnosis using the Medical Outcome Study Short Form-36 (SF-36). The overall prevalence, types of CAM used, and costs of CAM were assessed. The effects of several variables including GHQL at baseline and 1 year after treatment on the prevalence of use of CAM were evaluated. A total of 164 respondents (47%) admitted using some type of CAM, of which 73 (45%) had used multiple types. “Health food,” in particular extract from Agaricus blazei, was the most common type of CAM used. CAM users had significantly lower scores for social function, general health perception, and vitality domains than CAM non-users 1 year after diagnosis. This tendency was more marked in users of multiple types of CAM. “Health food,” including extract from A. blazei, was the most commonly used CAM in Japan. The prevalence of CAM use did not differ between patients with prostate cancer and those with urologic cancer other than prostrate cancer. CAM users, especially those who used multiple types of CAM, had lower GHQL scores than non-users of CAM. We thank Drs. Utsunomiya, Kohei, Terada, and Inoue for their cooperation with this study.